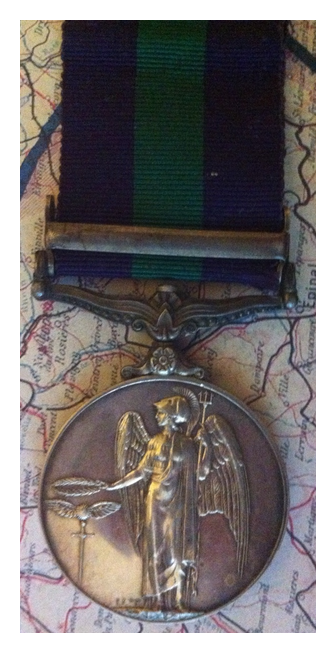 The General Service Medal was instituted to recognise service in minor Army and Air Force operations for which no separate medal was intended. It was equivalent to the NGSM. This particular example was awarded for operations in Singapore and the Malay Peninsula during the “Malayan Emergency”, a successful counter-insurgency operation against communist guerillas. The qualifying dates for service were between 16 June 1948 and 31 July 1960. For the Colony of Singapore, the date period was between 16 June 1948 to 31 January 1959. The example I have is impressed to I0566 S/SGT IBRAHIM BIN SHUKOR F. of M.POL. This entry was posted on February 28, 2010 at 9:15 PM and is filed under Gone to a new home. You can follow any responses to this entry through the RSS 2.0 feed. You can leave a response, or trackback from your own site.